Floor Spring Closers provide the functionality of a concealed closer fitted into the floor, preventing accidents by stopping heavy doors from slamming and avoiding the spread of fire by keeping internal doors closed. We stock both single and double action closers, designed for doors up to 1,400mm in width and 300kg in weight. The first only allows a single directional control when opening and closing the door, while the latter option can swing open and close in both directions. Floor springs are ideal for residential and commercial situations when the door closer needs to be invisible, enhancing aesthetics and maintaining the technical performance and durability which is standard with concealed closers. Our range of floor spring closers is available in satin stainless steel. These types of closers are suitable for high traffic locations and heavy doors, in addition it can also be fitted to glass doors. These mechanisms offer maximum flexibility by having adjustable features choosing both closing speed and latching action by valve. 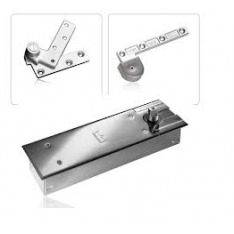 Ironmongery Experts also offers electromagnetic door closers, which will close automatically in the event of a fire and closers for both light or high traffic situations, such as light duty door closers and medium duty door closers.